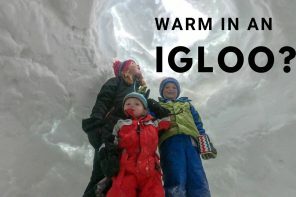 We’ve adopted the philosophy that getting out kids out on skis as soon as possible is the best option for us…so all three of them so far have started right around 18 months old! 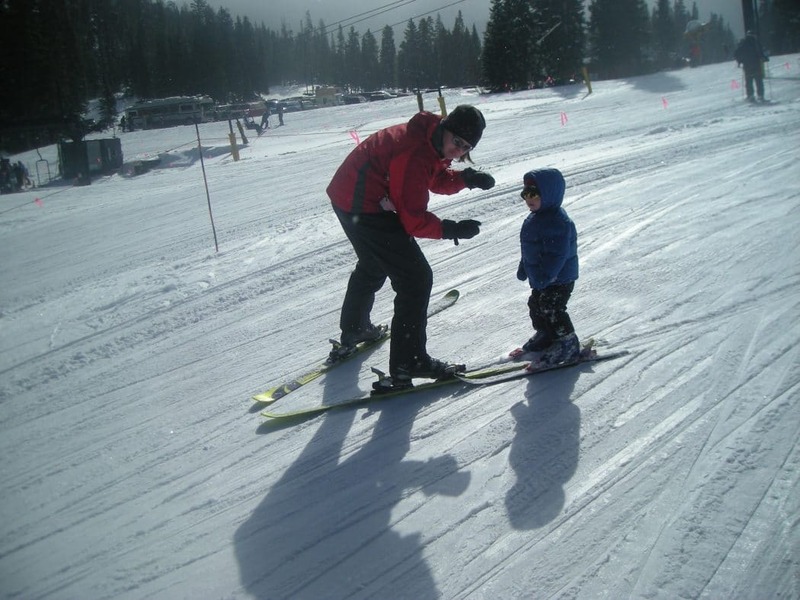 Naturally, one of the questions we are asked most is “how do you teach toddlers to ski”. Today, we’re sharing our secrets! 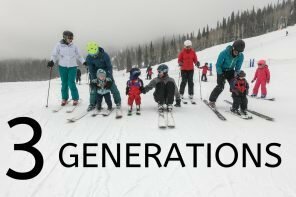 No, we’re not crazy competitive parents who are trying to force an olympic ski career on kids who can barely walk, actually just the opposite – parents who loathe being stuck in the lodge when great snow is just out the door. 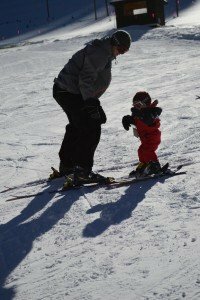 Can a one-year-old really learn how to ski? Not really. But hey, being on the bunny hill sure beats being in the lodge and is a great way to get kids really excited about skiing for the next season when they’re 2 and can actually figure a few things out (yes, all of our kids could stop and turn independently by age 2 since we started them like this). First, have realistic expectations! Like I mentioned before, the first season of skiing with a toddler can easily produce no real skills at the end of it. Your goal is to get a kid who WANTS to ski, and hopefully ski a lot! What can toddlers learn? The most important skill is balance. Yes, I know it sounds simple, but balance is really hard for these tiny kids and will set the stage for a lifetime of good skiing habits. The next skill is focus. 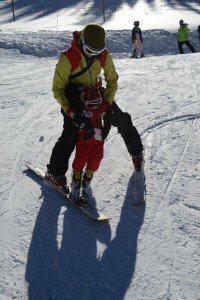 Skiing presents an entirely new set of distractions so getting your child to focus and look where they need to is huge. Outside of those things, I consider anything else learned a bonus. Now before I begin showing you how we teach our kids, note that this is not a technique that should be used by anyone who is not VERY comfortable on skis. You will spend almost all of your time skiing backwards, so you need to be pretty good at that and also have a good awareness of the mountain and fast reaction time. 3. Ski backwards making S-turns so that your child gets a feel for what they should be doing on the hill. Since their edgie wedgie is pressed up against your binding, they will go where you go. Mostly because it forces the child to balance. They have to stand up all by themselves as they get used to the feel and movement of their skis. It shows them what it feels like to turn and change direction as well. Also, because you are right in front of them, it not only helps them feel safe and secure, but blocks out a lot of distractions, teaching them that when they ski, they need to look at Mom or Dad (trust me, that’s a lifesaver down the road). As you child gets older and increases in confidence, this is also a great way to teach them to stop in a safe and controlled way (read more on getting your kids to STOP here). Since their edgie wedgie is just pushed up against your binding, if they stop their skis on their own, they really will stop even if you keep going! Most of all, make it FUN! We always take lots of little snacks with us (smarties and mini M&M’s are perfect for this age) and load them up. When ever they do something good, or just need a little boost to keep going, pop one in their mouth. Also, set realistic time goals. No toddler can ski for a whole day or likely even a whole morning. If they make it an hour, awesome! 2? Incredible! 30 minutes? No big deal! Our magic ratio has been 1 part skiing to 2 parts hot chocolate drinking…yes that’s a lot of hot chocolate. Are you going to be spending a ton of time on the slopes with a toddler? NO! But it sure beats being stuck in the lodge, or worse, being stuck at home! Set the stage early and you’ll be set for life! 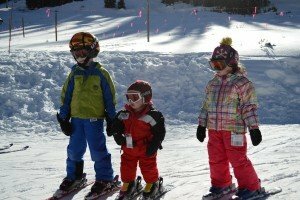 Looking for more positions to teach your kids to ski in? 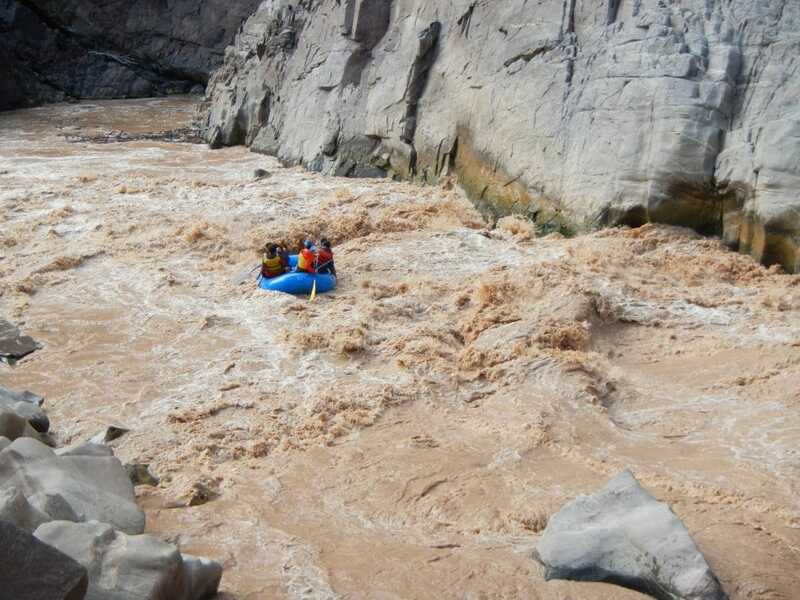 Check out this awesome list here. Just skiing with them between your legs (you will end up with a rag-doll child in .01 seconds). Using a harness before they can stop and turn on their own (these are tools to help hone these skills and the handle is great for helping them onto lifts and pick them up when they fall, not teach them). Being overly technical (they are kids afterall, who probably don’t know left from right. Talking about pressure and edges will get you no where). Trying to teach a child when you are not skilled yourself (likely, you’ll both end up frustrated and wanting to throw your skis in the dumpster). 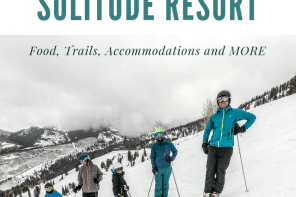 A limp lifeless little skier…bad news! Previous articleUsing a Ski Harness the RIGHT WAY!! Where and how do you find skis and boot small enough for an 18 month old. I want to take my 23 month old skiing, she is tiny size 5toddler. What sizes skis would she use? Love your blog! 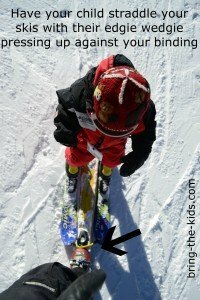 You are right – that is how the instructors teach the little kids – but I cannot ski backwards! I tried the kid-skiing-between-my-legs thing and it sort of works if you a pole in front of you for your child to hold… but still after 1 run you are pretty exhausted! In the end, we managed by staying on very gentle terrain and doing lots of drills to practice turning and stopping before venturing onto the chair lift. My 5 yr old is a rockstar on blue runs now, but I might look into that edgie wedgie so my husband can use it with our 3 yr old. Awesome idea!!!!! Could turn you please help me where do you find skis and boot small enough for an 21 month old?I have already called several rental companies but they thought I’m crazy. Thank you for your reply.